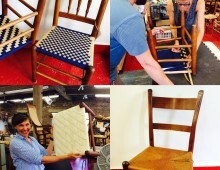 Learn to weave Shaker tape on a chair with four rails. General: Named after the religious sect, the Shakers, who were meticulous in their work and believed that even the furniture they created was a reflection of God. The inexpensive cotton tape (which is part of the clean utilitarian design) has now become more expensive but is a lot of fun to weave with. Shaker tape weaving is similar to splint weaving but is easier on your hands and creates a beautiful and comfortable seat. Any seat that has once had rush or splint/reed strips can be repaired with this technique. There are two different sizes of shaker tape (5/8” and 1”) and many different colors. See Shaker Workshops for examples. 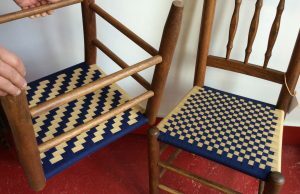 Learn to weave with Shaker tape on standard chair seat. Shaker tape comes in many colors and two sizes. Patterns are infinite, but in class you will learn checkerboard and herringbone twill. Tuition: includes one or two colors of Shaker Tape, five hours of instruction, and all tools and materials* necessary to complete a project. BYOC: Bring your own chair or we can provide one for you with advanced notice at $20-$40. *BEFORE CLASS: Students need to choose colors of Shaker tape at least 2 weeks in advance of the class. Stop by the school to see colors in person or look online at Shaker Workshops. Please note that there are different sizes of shaker tape (5/8” , 7/8″ , & 1”). Please have a second choice for colors…Recently a few Shaker tape colors have been back-ordered for a while. IMPORTANT: Please read through our Workshop FAQs.